What exactly makes a diamond so special, and how do we judge a diamond to determine its value? By simply using what’s knowns as the 5C’s, namely Cut, Colour, Clarity, Carat Weight and confidence. Learn how important it is to cut the diamond correct, why clarity matters, what the colour of a diamond can determine and so much more. No two diamonds are the same, which is just part of what makes this glittering gem so spectacular. From its formation deep within the Earth’s crust billions of years ago, to the moment you showcase its beauty in the form of a stunning jewellery creation, there are four things to consider when it comes to what truly differentiates one diamond from another, namely the 5Cs – Cut, Colour, Clarity, Carat Weight and confidence. 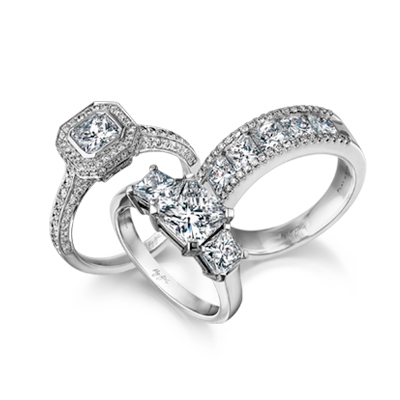 Diamonds range in colour from the purest white to shades of fine yellow. The colour of a diamond is determined by nature. The 5th C - knowing that you are buying a diamond through a reputable jeweller, that was sourced ethically and conflict-free. Carat is the standard unit of weight. One carat = 0.2 grams, or 200milligrams. The higher the carat, the more rare and valuable the diamond. A diamond should "celebrate brilliant moments and create everlasting memories." After all, a diamond is as unique as you are.